Under 18 years of age have free admission. Noise of Time at Maritime Centre Vellamo in Kotka exhibits works from a cross-section of more than 20 established Russian contemporary artists and displays about 40 paintings from different parts of Russia. It offers tasters of contemporary art from recent times as well as from the Soviet era. Noise of Time is the first exhibition of Erarta in Finland and the result of collaboration between Erarta and Kymenlaakso Museum. 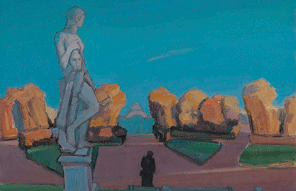 Don’t miss this unique opportunity to view contemporary Russian art in Finland! The characters of the painting The Fairy Tale by ELENA FIGURINA can barely be called human beings, despite their obvious anthropomorphic traits. They are raising their hands thus praising God for good luck as they have caught a fish that one of them is holding up. 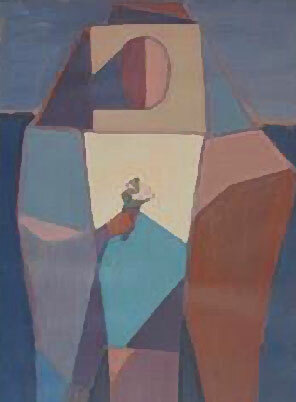 The biblical theme is typical to Figurina, and here we can see it referring to the evangelical catch. The characters are pictured in deep warm tones, floating in the azure of the surrounding area, like a miracle: they “recognise” Him and are frozen in awe. 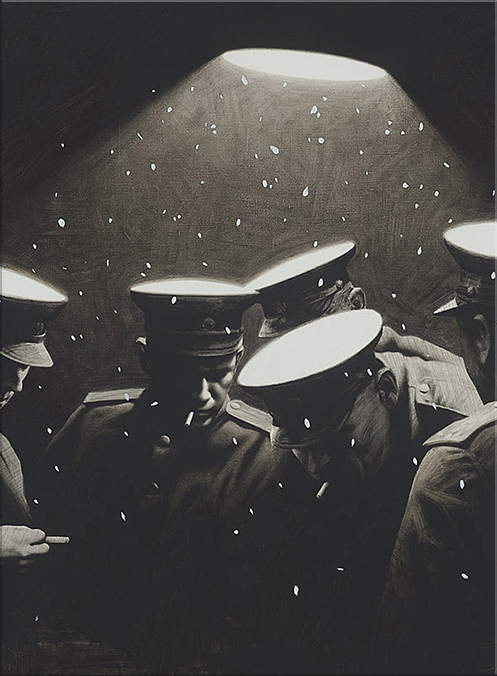 In the picture Light by RINAT VOLIGAMSI a group of military men examine something that eludes the audience as the subject of their intense interest vanishes outside the canvas. Like floating nimbuses over their heads, the peaked caps are illuminated by a bright light. The light penetrates the darkness and makes also the falling snowflakes visible. We don’t know who these people are or what they are trying to see in the dark. Maybe they are looking at a map in an attempt to find their way out of the absorbing twilight? In Staring at the Sky YURY SYCHEV has used soft colours in his usual sketchy manner and created a sensation of flight still dwelling in the picture. The character dreamily gazes into the sky, wind fluttering her hair and her face lit by sunlight. She quietly looks upward as if hoping to see some peculiar clouds of her beautiful future. The vital force anchored in her eyes, the raised head and the contour of her lips emphasise a passing moment captured in the picture. Our museums tell stories so that history can be experienced again. We also exhibit art, because through it stories are created giving emotional experiences to the viewer. MARITIME CENTRE VELLAMO is a unique combination of museums, art, meetings and other events. Our museums - the Maritime Museum of Finland and Kymenlaakso Museum - offer a variety of exhibitions. One ticket gives you access to them all, and our restaurant and museum shop are also at your service. KYMENLAAKSO MUSEUM offers contemporary art exhibitions and historical exhibitions. It also maintains the Kotka City Art Collection consisting of approximately 1300 paintings and other works of art placed in public facilities around Kotka. The city’s collection also includes sculptures from several renowned artists placed along the award-winning Sculpture Promenade at the Kotka city centre. The promenade extends over two kilometres and it is a popular outdoor attraction frequently visited by tourists and residents alike. Our partner ERARTA is the biggest museum of contemporary art in Russia, a must-see attraction for gaining insight into modern Russian society. The name Erarta is derived from two words, Era and Art, and their combination can be translated from Russian as “the era of art”. At the heart of Erarta lies the desire to build a relationship between people and art. The most important person at Erarta is the viewer. The people working at Erarta love art, and believe that love of art can make any individual’s life more interesting and fulfilling and, ultimately, happy. Contemporary art is a great way for Kymenlaakso Museum to stay abreast of current and recent times. What about you, our visitor? Just come and experience arts at Vellamo! Tue, Thu–Sun 10am–5pm, Wed 10am–8pm and Mon closed. Anatoly Basin was born in a military family, in Leningrad in 1936. He got solid technical education, graduated from Radio-Technical School and Architectural Department of Leningrad State Institute of Engineering and Architecture. He worked as an engineer and an architect for some time. As an artist Basin experienced great influence of his teacher Osip Sidlin. 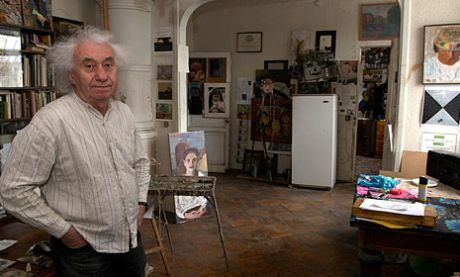 He visited his studio in a Kapranov Palace of Culture from 1956 to 1972. Sidlin’s creative heritage is still being a subject of comprehension for Basin, as Anatoly Basin is not only an artist, but a keeper of certain tradition, memory keeper, myth-maker, and a narrator in some way. For many years Basin stands by sombre colour treatment that calls light out of dark, creates special depth of colour space that turns to be not the imitation of the reality, but the reflection of painter’s consciousness. Line on Basin’s canvases snatches contours of female body or subjects of still-life out of darkness. Again and again Basin appeals to the same simple subject what happens not because the artist can’t manage with it. This is a solemn performance and at the same time deliberate human’s intrusion into the sacral spheres. The artist obsessively aspires to “see the voices” as Moses saw God on Mount Sinai. Philosophical and even mystical quests are peculiar to Basin. “In another world I won’t be asked why I haven’t been Moses, I’ll be asked why I haven’t been Myself”. Basin quotes this citation without indicating the source in his small article in 1981. Intent look inside his own soul and searching for himself in his own works seem to interest the painter even more than painting. The artist willingly shares the results with the viewers, publishing from time to time texts full of quotations and linguistic studies. Notwithstanding the inclination to theorize, Basin doesn’t make an impression of a severe wise man. He eagerly hands down his knowledge to his apprentices, while his private archive formed the basis for the well-known album called “Gazanevshchina”* published in Jerusalem and then in Saint Petersburg as well. * A unifying name of two legally allowed nonconformist exhibitions that were held in Gaza Palace of Culture and “Nevsky” Palace of Culture. 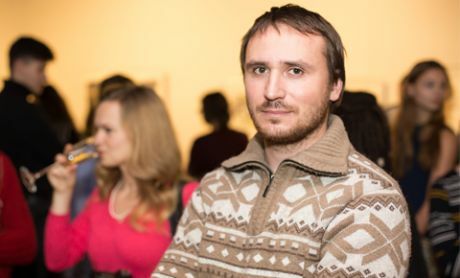 Alexander Dashevsky is an unique artist in terms of his approach to subject matter and his execution of content. His unusual choice of focus within his works should not be simply dismissed as lacking dexterity. Rather, it is important to account for the fact that Daskevky freely admits to the content of his paintings choosing him. 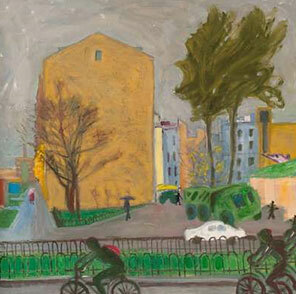 Dashevsky’s work can be characterized as new urbanism. The city planning of today blurs the traditional boundaries between the city, suburbs and industry. Block housing and empty lots unfurl into the never-ending Russian nature. As a “poet of the agglomeration,” Dashevsky moves in the same direction that American artists of the 1960’s to the 80’s — out of the city center. 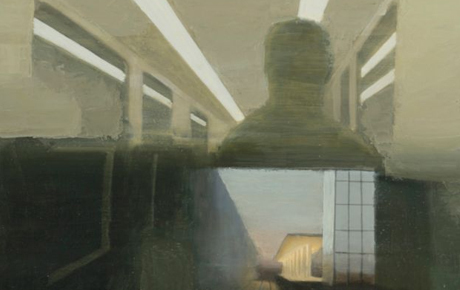 He probes the American poetic of melancholy and forlornness in his own territory, which has its own industrial tradition in the art of Futurism and Social Realism. The alienating anti-aesthetic of garages and shanty-towns blends into his painterly aesthetic of abstraction that plays with shades of colors, surfaces and depths. His paintings can be seen as science-fiction landscapes, painterly patchworks, technical blueprints, or as the dreams of lonely people. The ambiguity and mysteriousness of his works are the most important elements of their charm. 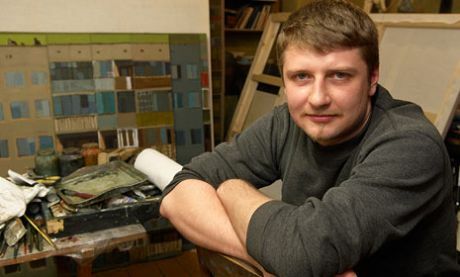 Alexander Dashevsky was born in 1980 in Leningrad. In 2003 he completed his studies at the St. Petersburg University for Film and Television and consequently studied art history at the St. Petersburg Repin Academy of Arts. 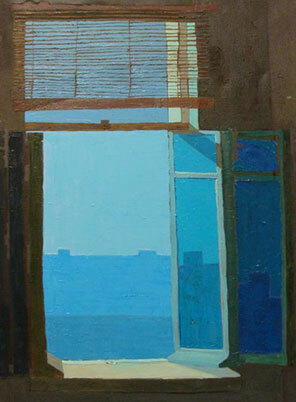 Since 2005, Dashevky has been a member of the International Federation of Artists. 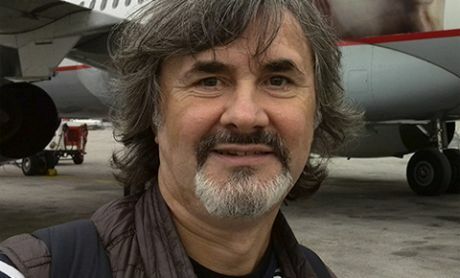 His work has been widely exhibited in Russia and abroad. Elena Figurina was born in Latvia in 1955, which at the time was part of the communist USSR. In 1969, consequently to her family moving to St. Petersburg, Figurina became increasingly involved and interested in the arts. Nonetheless, due to the absence of financial support for artists at the time, as well as the external pressure exerted upon her by her family, Figurina was accepted into the Leningrad Institute of Aviation. Figurina commenced her education within the institute with engineering, although she went on to graduate as a sculptor and modeler. Furthermore, throughout her studies and following her graduation, Figurina was also continuously participating and securing both solo and group exhibitions. By the time of her graduation and due to the increased external interest towards her works, Figurina joined the Letopis' art group headed by Boris Koshelokhov. On account of the nature of the artworks that were actualized by the group, the Letopis were accused of not complying with the politically accepted artistic rules and regulations. At the time, social realism was the only satisfactory movement that was approved by the government, ensuring that one of the exhibitions, as set up by the Letopis group n 1978 was indeed shut down. 1981 saw Figurina join the Association of Experimental Art (TEII), which was created in order to organize non-conformist underground exhibitions. 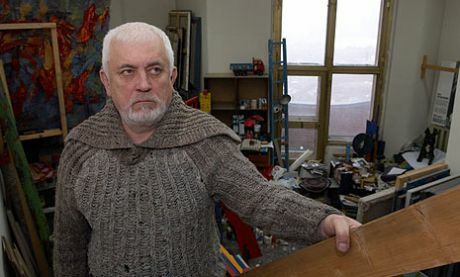 The Contemporary Art Academy of the Deathless, another avant-garde contemporary Russian art circle, as led and founded by Felix Volosenkov counted Figurina as a member from 2000 onwards. The founder’s intention was to unite acknowledged and innovative artists in Russia at the time. This artistic affiliation with the group as well as her exponential rise to fame, has secured Figurina as the epitome of a St. Petersburg artist. Figurina confesses that she can't live without her work. Perpetually, Figurina keeps asking herself if she is a true artist, as she treats art neither as a profession nor a vocation. Art is Figurina’s individual way of existing as a rational and sentient being. Figurina maintains that the production of art is not just a laborious process in terms of physicality of it, but should also be considered an emotional challenge as well. Finding the delicate balance of expressing your inner most being without falling over the edge into insanity, is the ultimate task when it comes to art, according to Figurina. Overall, since her membership at the St. Petersburg Academy of Modern Art as one of the resident artists in 2000, Figurina has participated in over 200 exhibitions both in Russia and abroad. Figurina's paintings and sculptures are part of museum and private collections in Australia, Belgium, Denmark, England, France, Finland, Germany, Holland, South Korea, Norway, Poland, Russia, Sweden, Switzerland, and the United States. Vladlen Gavrilchik was born in 1929 in an Uzbek town of Termez. Gavrilchik was inspired towards drawing from the beginning of his school days. The young artist’s step-mother enrolled him in an art school secretly, although the opportunity for him to study there never manifested. Consequently to his completion from school, Gavrilchik went on to graduate from the Suvorov School in Tashkent in 1947, and later from the High Naval School in Leningrad in 1951. 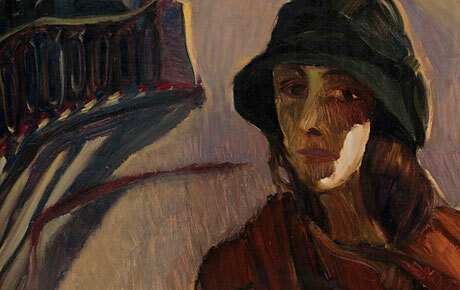 Gavrilchik’s painting practice began in Leningrad after he demobilized in the early 1950s. The emerging artist attended drawing studios at cultural centers and studied many movements and techniques through consistent visitation of museums and exhibitions, as well as personal affiliations with artists at the time. 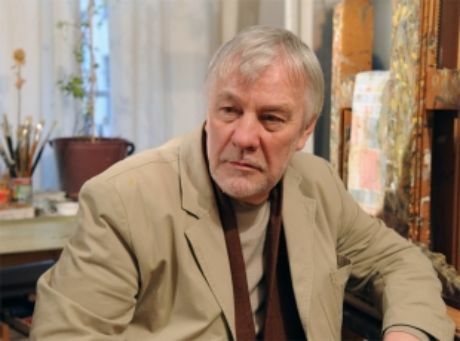 His encounter with Mikhail Tsibasov, one of the most talented students of Pavel Filonov, had an important influence on Gavrilchik’s development. 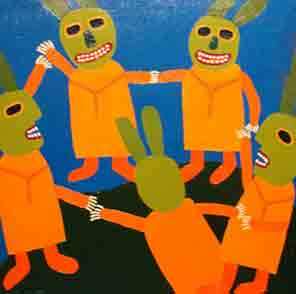 Gavrilchik’s work can be associated with naive and primitive art. Nonetheless, that is not to say that his technique is not refined and guided by classical training. Rather, Gavrilchik actively pursues unpretentious landscapes, still lifes with broken gramophone records and numerous self-portraits. All together these present a narrative of Soviet culture. 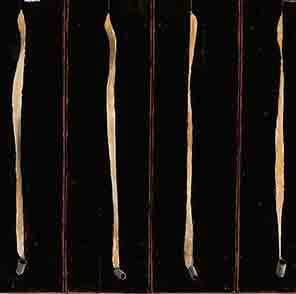 Gavrilchik’s perceived simplicity is illusionary. By romanticizing a portrait, poeticizing an unappealing view or turning a rigid Soviet mythologem into a lubok picture with folk sensibilities, the artist ironically plays up a human desire to get closer to the world of elegance. To some extent Gavrilchik is an apotheosis of this desire. He expresses himself not only through painting and graphics, but also through photography, art objects and even poetry. Folklore motifs are distinctive in his poetry. Gavrilchik uses folk themes like a sorrowful song; a theme that combines a naïve form and a bloodcurdling plot. In his painting and poetry, Gavrilchik revels in the process and essence of creativity which produces a unique effect of light irony. Ilya Gaponov was born in 1981 in Kemerovo, an industrial mining town in the Novosibirsk region. 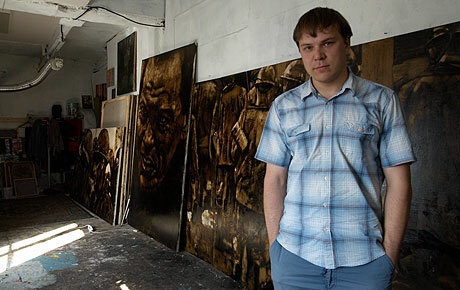 His monumental and intensely detailed paintings are created with bitumen and Kuzbass varnish, both byproducts of coal mining. The monumental scale of Gaponov’s work recalls the epic paintings of historical revolution but with entirely contemporary content. His unaffected observation combines with his superb academic craftsmanship to create deeply moving images of unparalleled sincerity. Frequently working in series and large narrative cycles his paintings are cinematic in scale, but the subjects are rendered with such extreme pragmatism that the paintings themselves ultimately become oddly distanced commentaries on spirituality and morality. Gaponov graduated from the Ecole des Beaux Arts in Paris in 2004 and continued his studies at the acclaimed Mukhina Academy in St Petersburg, graduating in 2007. He continues to live and work in St Petersburg. Until 2010 he worked in partnership with Kirill Koteshov, also from Kemerovo. Alexandr Grekov (born 1982 in Kagul, Moldavian SSR). Lives and works in Perm. Education 2002 – graduated from the art department of Perm Professional Lyceum №65; 2007 – graduated from the Ural Branch of the Russian Academy of Painting, Sculpture and Architecture, Perm Selected solo and group exhibitions 2011 – "Genius Loci", Central Exhibition Hall, Perm; 2011 – "A mighty will, a great glory", solo exhibition, «GreenArt» Gallery of Contemporary Art, Perm; 2010 – "Revolutionary realism", solo exhibition, «GreenArt» Gallery of Contemporary Art, Perm; 2010 – "Myths and Legends of the Great Perm", Central Exhibition Hall, Perm; 2008 – «DICO. Wooden idols Contemporary», «GreenArt» Gallery of Contemporary Art, Perm; 2007 – "The reality in a square", Central Exhibition Hall, Perm. The works are presented in the collections of Erarta Museum of Contemporary Art, St. Petersburg; The New Collection Fund, Perm; and in private collections. Mikhail Ivanov was borni in Leningradissa in 1944. As a child he was drawing and participated in arts classes. Later he studied in the Ilya Repin Leningrad Institute for Painting. Since the moment of their meeting at the department of art and graphics at Herzen University, Natalia Melnikova and Vladimir Fomichev (Fomichyov) have shared a common life and a common pseudonym, Ko-MEL-FO. Born in Leningrad in 1961, Natalia Melnikova enrolled at Herzen University to study drawing and painting immediately after completing secondary school. After graduating in 1987, she began working as the head of an art studio in the Nevsky Cultural Center, a legendary place in the history of Leningrad underground art. 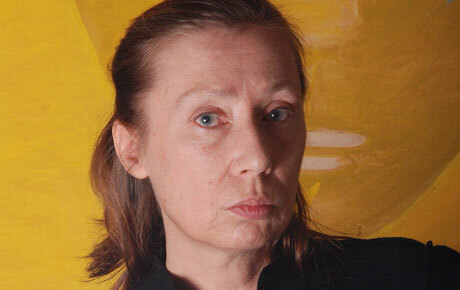 Natalia Melnikova passed away in 2003, leaving positive memories and an impressive record in the art of Saint-Petersburg. Vladimir Fomichev was born in 1953. A graduate from the Leningrad machine-building institute, he went on to study art at Herzen. Due to his first technical education, KoMELFO have complex kinetic objects among their works, as well as interesting solutions for arranging expositions. 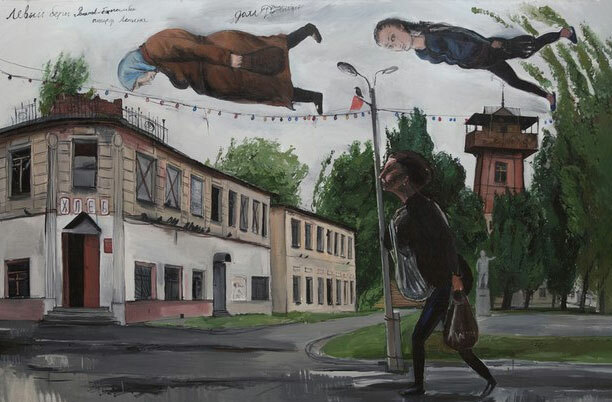 Melnikova and Fomichev’s tandem became prominent in the art life of Saint-Petersburg since 1985, when they began organizing art events and participating in exhibitions in Russia and abroad. One of Melnikova and Fomichev’s most interesting joint projects was introduced in 2000 under the title Na Oshchup’ (By Touch). This was KoMELFO’s artwork exhibition in Antarctica. The exposition, which included 54 art pieces, opened on 31 December, 1999. In the frameworks of the project, KoMELFO published the book – A Concise Russian-Antarctic Dictionary. Romantic Version. Currently, Vladimir Fomichev works with Zoya Norina. The artist kept the name KoMELFO in memory of Natalia Melnikova, therefore Vladimir Fomichev and Zoya Norina’s common works are signed as KoMELFO and Norina. Their exhibitions are always aimed at the dialogue with a viewer — the pictures can be suspended in the air, or stretched on a drum and spun. Thus, they include space into their works of art and invite the audience to make their own interpretations of an unexpected artistic approach. Born in the Amur region in 1959, Kosenkov first studied at the Ivanovo State Technical University in Novosibirsk. In 1984 he began studying in the studio of Natalia Chizhik and remained one of her students until 1998. Inspired by everyday objects, Kosenkov imbues shapes with such vibrancy that they appear to burst from the canvas. His paintings are a visual refection of the landscape of his mind, made up of street scenes, landscapes, interiors, figures and architecture. He is fascinated by the mixture of archaic elements and powerfully coloured shapes, while simultaneously using patterns to symbolize the nexus between the natural reality of the figure and the colorful world he creates. Kosenkov’s paintings can be found in public and private collections in Russia and abroad in the USA, Germany, UK, France, Belgium, Spain, Italy, Norway, and Israel. Valery Lukka was born in 1945 in the village Porokhovo, located in the Yaroslavl region. In 1977, Lukka received a diploma from the Repin Institute of Painting, Sculpture and Architecture in Leningrad, where he later started his artistic activity. In the late seventies, Lukka, along with Vyacheslav Mikhailov (also an Academy of Arts graduate) and Felix Volosenkov, became a founding member of an art group devoted to searching for new ways of expression, as all art groups do. In order to create a desired artistic effect, the group members use layers of paint to create relief. This is how they rejected an established painting tradition they respected. They aimed at making their works closer to true life and more organic. In addition to their true to life focus, their creative work still contained literary references and links to eternal mythological images. The most of their attention, however, was paid to the physiology of texture. 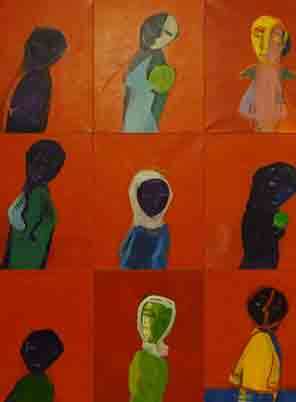 Experts of Lukka’s art describe his works as containing a ‘specific individual style of conceptual expressionism’. Indeed, Lukka’s painting is distinguished by its sincerity and often with sick hysterics, but, being a true fruit of postmodernism, it is charged with irony and full of references from classical art. 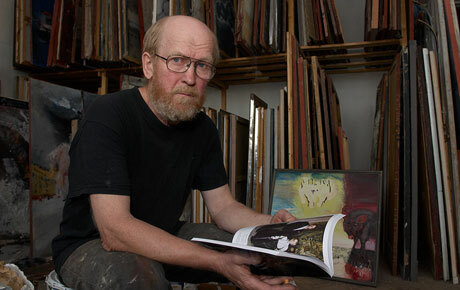 He chose not to use customary techniques and themes in order to give his art a "living" quality, which is an approach that has its followers. Each of the three innovative group members are canonized by art critics and admirers who call the group TheThree Bogatyrs (a group of heroes from the Russian folk epics). 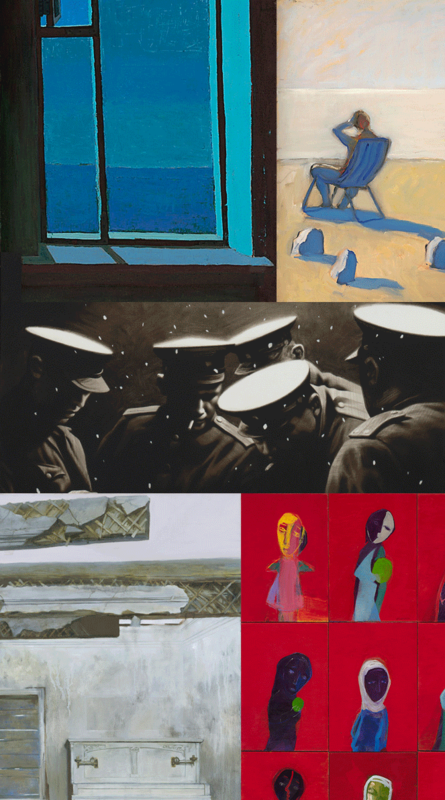 The artwork of Felix Volosenkov and Vyacheslav Mikhailov is also featured in the museum collection. Being fascinated by painting and given the ability to see things invisible to the others, artist is akin to a visionist. The nature of such penetrating vision implies the disintegration of cause-and-effect relations: subject is no longer just an image-symbol, fixed in language and consciousness; it transforms into something else. The years of apprenticeship and creative experience testify that Dmitry Margolin have mastered all the technical intricacies to perfection. Nevertheless he chooses to follow the path of simplifying his artistic language. 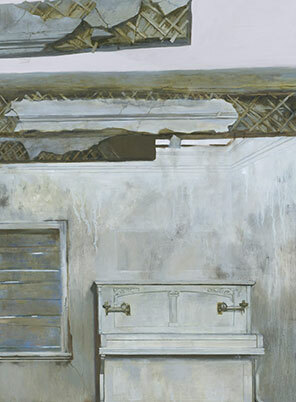 The paintings by Dmitry Margolin reflect the eternal dialogue of artist and tradition. The author deliberately ignores to talk about the crisis of fine arts and to express innovative maxims about the burden of traditions, considering such declamations nothing more but fashion. For him painting is rather the good, giving the joy of understanding; and the dialogue with the tradition is a mystical process allowing the artist to feel spiritual kinship with the long left masters of this world. The very nature of Margolin’s painting is consonant with the ideas of expressionists. According to the author, he was brought to such archetypal images and eternal subjects as Oedipus or Job by something irrational. The creative process for Margolin is associated with persecution of certain inexplicable impulses. The artist depicts not what he sees or the cultural memory dictates, but such subtle impressions as a familiar smell from the childhood or an intense color experience. Thus he tightly shuts his studio door for the audience: this creative kitchen cannot be described in words. The comparison with culinary is more than appropriate: Margolin admits that painting resembles cooking — prosecution and embodiment of a certain taste idea. Indeed, when looking at the lines of Margolin’s etchings or when studying the texture of his paintings there comes a feeling of a very sensual nature of these works. Even the fundamental function of art as a means of self-knowledge and learning the world he finds illusory and inapplicable to reality. Margolin percepts creativity as a way to achieve freedom. What kind of freedom exactly, is not quite clear, but to the question whether painting is one of the passions, Margolin answers affirmatively with no hesitation: “Yes. Perhaps, I'm obsessed. Hence, my freedom is out of the question”. And there are plenty of such contradictions, which being born from the life experience, saturate his works with existential pathos, ultimate emotionality and sensuality. These artworks of spirit can be understood only through the eternal mythological subjects. Vyacheslav Mikhailov was born in the remote village of Arzgir, located in the Stavropol region. After serving in the army, Mikhailov attended the Repin Institute of Painting, Sculpture and Architecture in Leningrad where he studied under the renowned art professor Yevsey Moisejenko. After completing his post-graduate studies in 1979, Mikhailov, along with Valery Lukka (also an Academy of Arts graduate) and Felix Volosenkov, founded an art group, later named by art critics The Three Bogatyrs, devoted to searching for new ways of expression. In order to create their desired painterly effect they used layers of levkas (a traditional material used in icon painting) and paint to create relief, and thus moved away from the established painting tradition, seeking to make their works more organic and visceral. Though their work contained literary references and links to mythology, their focus was the physicality of texture. Now one of the foremost painters in St. Petersburg, Mikhailov has developed a painterly language that is founded in form and semantics. His paintings fascinate with their intricate surfaces and saturated colours. Working in large series and developing a group of work over an extended period of time, Mikhailov cherishes the notion of memory in his work, and is himself committed to both the present and the past in his painting practice. In the early 1980’s Mikhailov began participating in various exhibitions, both in Russia and abroad in Europe, China and America. He had a solo exhibition at the Russian State Museum in 1995 and contributed to a group exhibition at the Hermitage Museum in 2004. 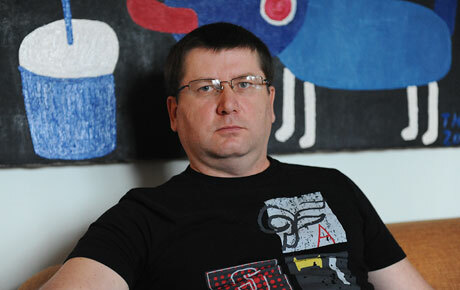 He is a member of the Russian Association of Artists and a member of the State Artists Association of Italy, "ITALART". 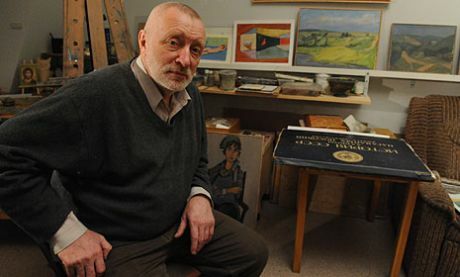 He was also awarded the title of `Honoured Artist of Russia'. Artur Molev was born in St. Petersburg in 1969. His multifaceted creative works include painting, poetry, animation and music. Molev is known for his close cooperation with a famous Petersburg rock band, Auktyon, that he assisted as an artist. 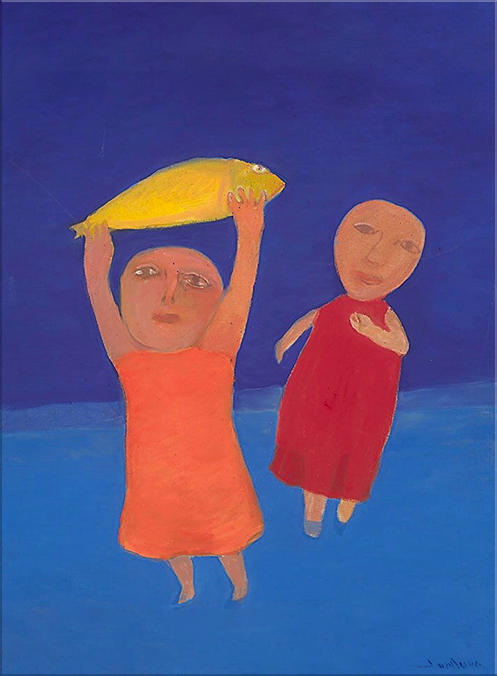 There is a temptation to view Molev’s bright paintings which are charged with the joy of life as simple children’s drawings. His unskillfully drawn, as it may seem at a first glance, angular figures of people and briefly contoured images of animals are reminiscent of ancient rock paintings or sketches from school notebooks. In fact, the artist has accomplished continuous studies (although with many breaks) in the Mukhina Art School. More importantly, the Petersburg panting tradition has made a significant and noticeable influence on his art. As a devoted disciple of Anatoly Zaslavsky, Molev continued developing the ideas of Petersburg expressionism by adding his unique and inimitable note of naïve art. The light childishness and sincerity of his paintings extend the imagery of the Petersburg landscape with his scintillating hot colour palette. 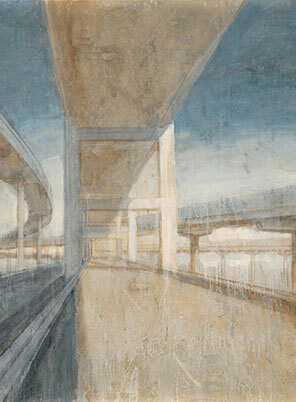 Customary city views have an acquired light optimistic spontaneity from under his brush. Currently, Molev lives in Holland and his glowing canvases feature cities that he has visited such as Amsterdam, Utrecht, Paris and Jerusalem. Died on 24 January, 2015. Vladimir Ovchinnikov’s fame precedes the need for an introduction, which is shown though his record with Sotheby’s, which was one of the most impressive among contemporary art sales. 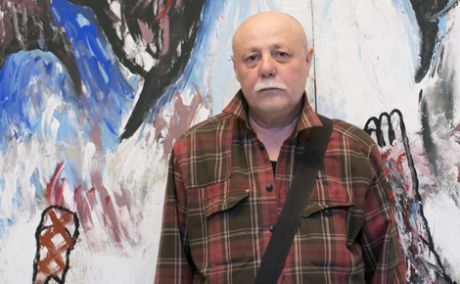 Internationally acknowledged as one of the leading artists in contemporary Russian art, it is simply a privilege to be able to include his works within our exhibition. His masterpieces stand out radically from all other included artists due to his consistent individualistic approach when it comes to exploring his own artistic talent. The most evident nature of his works is his persistent use of gold, which is highly unusual for a contemporary Russian artist. This inclusion of gold echoes traditional iconography, which serves to represent the Russian Orthodox Church; consequently ensuring that the mind of the viewer wonders to the hidden message within. In relation to the subject of contemplation of the unknown, Ovchinnikov also frequently turns to ancient myths and scriptural topics, provoking viewers to interpret his works as mythological messages. Simultaneously, he substitutes the characters of the chosen parable with his own personages – excessively carnival and narcissist in character. The personage does not correspond to any kind of advisability – neither mythological, nor realistic. 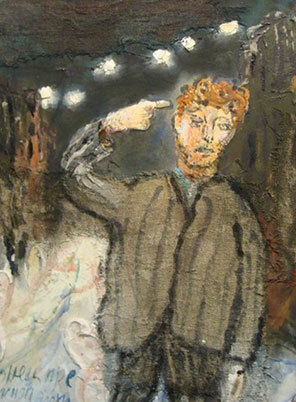 The subject personage remains alien and destructive, disregarding the context in which the artist places him. 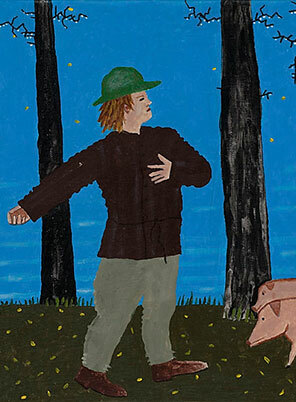 His paintings give us a fine example of the artistic interpretation of absurdity. 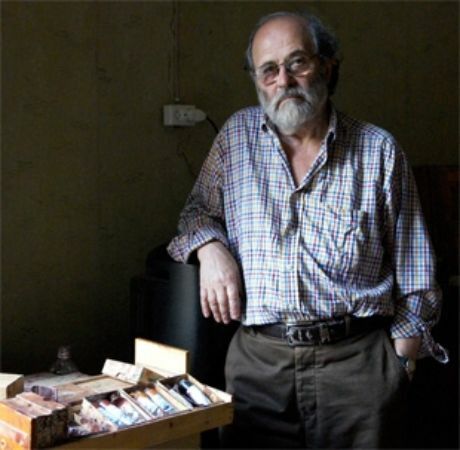 In terms of personal biography, Ovchinikov was born in 1941 in the Perm region, where his family was evacuated during the World War II. From 1945 onwards he lived and worked in Leningrad/St.Petersburg. Although Ovchinikov has not received any classical education from state art schools and colleges this has not prevented the artist from achieving national as well as international fame. At present, he is a member and deputy chairman of the St.Petersburg Department of the International Federation of Artists. Aleksandr Rumyantsev was born in Leningrad in 1951. By the age of 24 the young artist already had a diploma in easel and monumental painting from the Academy of Arts, where he obtained a classic artistic education, and was practicing in the workshop of Andrey Mylnikov. 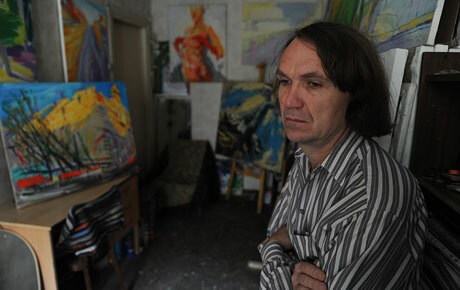 After graduating in 1976, Rumyantsev started to teach at the Academy. Although he was quite fond of his work, it became harder and harder for him to combine teaching, painting and attending regular exhibitions in Russia and abroad. For that reason Rumyantsev left the Academy in 1984. It would seem easy to imagine the artwork of a person with such a classical artistic background, although in case of Rumyantsev such assumptions are likely to be wrong. Rumyantsev has a free style: ordinary land- and cityscapes gain spontaneity. Their curved, unexpected lines follow the brush and it is as though it is not the landscape directing the artist’s hand, but rather the artist’s hand controlling the landscape. Rumyantsev’s style is a lyrical sort of expressionism, a style that exists in isolation from classical German or American expressionism. This is a kind of expressionism that not characterised by strain, pain or the bursting of emotions. Rumyantsev’s artwork that is featured in the Erarta Collection is mostly from the rural series. Part of the collection was painted before 2000, at which time Rumyantsev moved to Germany. In spite of the fact that the artist lives in Germany at the moment, he visits Saint-Petersburg quite often to take part in big city exhibitions and small art events organised by friends. 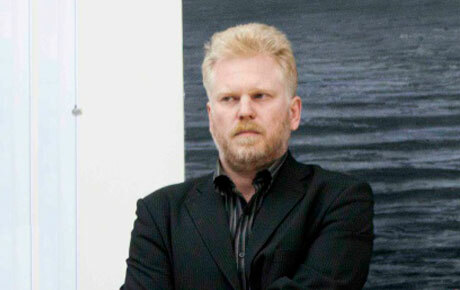 Petr Shvetsov was born in Leningrad in 1970. He graduated from the secondary art school in the Academy of Arts and went on to explore European art. In the early 1990s, Shvetsov had opportunities to work in England, Denmark, Finland and often visited the USA. Shvetsov’s international creative activity has clearly had a positive influence on his artistic talent. 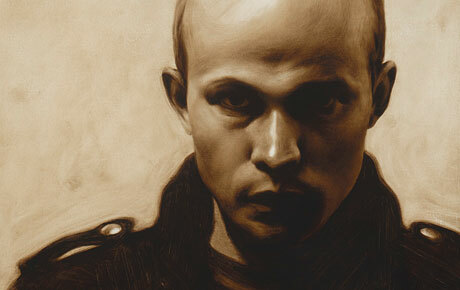 Today, Petr Shvetsov is one of the most well-known contemporary Petersburg artists by those outside of Russia. He became famous for his shocking exhibition projects. Exhibitions such as Pandora’s Box with living flies in a cocoon and The Living and the Dead with a stuffed fox defiled by moths and poured over with silicone show his morbid content selections. He also has exhibitions featuring refined painting including the Marsh series and The Head of an Architect series, which were worked on over the period of thirteen years. With equal wit and expressiveness, Shvetsov establishes daring projects in the spirit of popular trends and returns to a traditional painting technique. He then works to hide his skills as an experienced graphic artist to shock the audience with grotesque characters of his pictures before getting back to artfully using pure lines in his following works again. 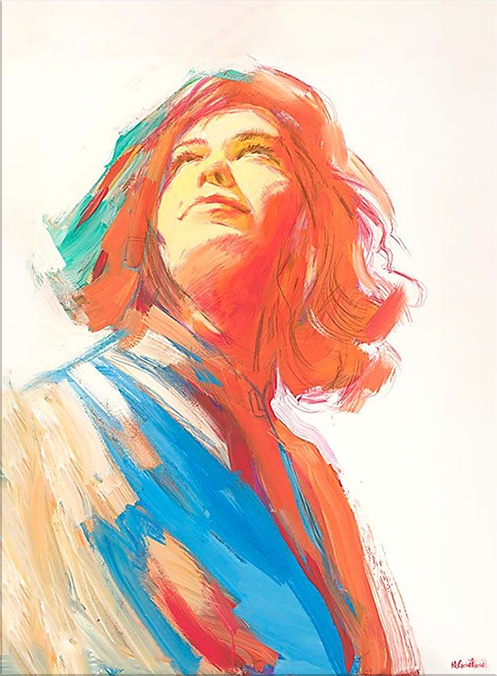 An attentive viewer, however, is able to see the artist's unique style that he established through a long, creative search process. Inna Sklyarevskaya was born in Leningrad in 1962. She began drawing when she was a child and went to secondary art school at the Repin Institute. After completing school, Inna graduated from the department of drama studies in the Academy of Dramatic Art. She worked as a drama critic and wrote articles on ballet for a few years. 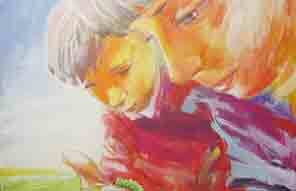 Sklyarevskaya returned to painting in the early nineties. Landscape became her favourite genre, and this is especially true of marine landscapes. The artist likes to place figures of people in her landscapes and, of course, she loves her dear home city of Saint-Petersburg. Sklyarevskaya’s painting is masterfully light. She uses a manner which might seem to be sketchy and unfinished. Nevertheless, her generalized compositions reveal the true profoundness of experience and a precise rendering of a state. 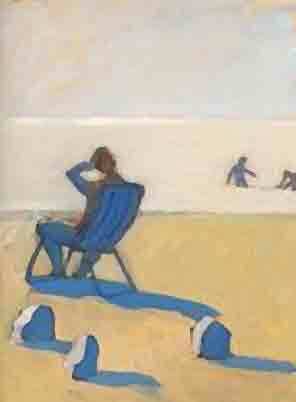 She confesses that she often paints intuitively and tries to complete her work quickly, in bursts of activity. In the year 2000, five artists, whom included Sklyarevskaya, formed an art group called The Children of Arkhip Kuindzhi. The group members share a devotion to painting based on their passing ‘impressions of nature’. 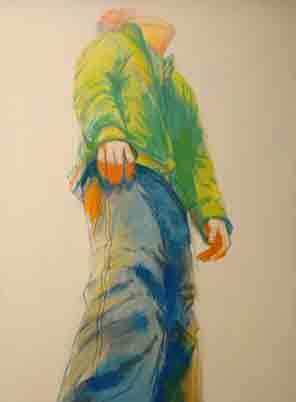 They add a rich, viscous colour to the sketch-like pictures. The artists like to depict Petersburg’s red-brick industrial constructions, grey desolated villages, and blue marine expanses. Apart from Inna Sklyarevskaya, other members of the art group have artwork that is featured in our collection, Boris Zabirokhin and Alla Dzhigirey. Despite their shared guidelines, each artist’s style is unique and recognizable. Sklyarevskaya’s artwork is distinct by its depictions of human figures dissolving into landscapes and the warm feeling of unity between man and nature that they produce. 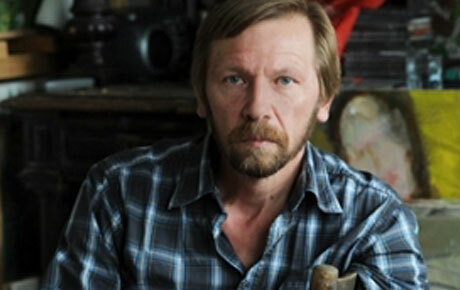 Yury Sychev was born in 1963 in Lermontov of the Stavropol region. Early in his life, Yury and a friend decided to enroll in a local art school, despite neither of them being able to draw. This was a life-changing event because when Yury first felt like an artist he realized his entire life would be devoted to art. The artist mentions that his professional career is greatly owed to a teacher from his provincial art school, Vyacheslav Zhuikov. This intuitive teacher spotted his talent and managed to set it on the right track. He encouraged Yury to go to the Nizhny Tagil Art School (famous for a strong department of applied art), and later to move to Saint-Petersburg. In 1983, after completing his studies at the department of metalworking at the Nizhny Tagil Art School, the artist realized that painting was more important to him than making jewelry. His teacher supported his desire to continue his education and Sychev chose the Petersburg Academy of Arts without any hesitation. Saint-Petersburg became his favourite city, the place where, according to him, you can return after a long journey and feel at home. Such a touching attachment to the city can easily be seen in Sychev’s cityscapes, which are always bright, vivacious, and filled with passionate affection to the world around. The richness of colour is not seen as a decorative trick, but felt as a consequence of an over-saturation by mysterious and all-encompassing energies which he has managed to notice and render on canvas. The artist says about his cityscapes, ‘Piter is a very light, bright city and I always use bright colours to depict it. I like these violet shadows and yellow houses. I like a sunlit city, saturated with colours. Piter has rid itself of all these stereotypes of a ‘Dostoyevsky-city’. I don’t see the city as grey and murky, even when it is raining.’ This metamorphosis of an ordinary city into a magic dream; which, like any magic, demands solitude and peace – this is why Sychev doesn’t like painting from nature and prefers to work in his studio. His favourite materials are acrylic, pastel and colour crayons, because they allow him to render the images coming to his mind very quickly, and the combination of painting and graphic techniques always helps to produce a wonderful effect. Veronese, Rembrandt, Kandinsky and all artists who have managed to create their own worlds which had not existed before are among Sychev’s favourite masters of the past. 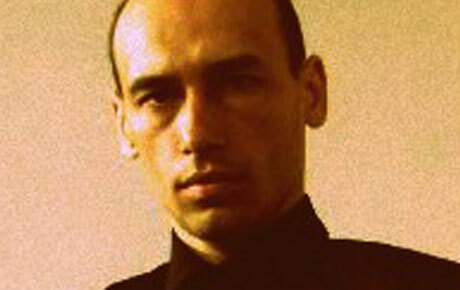 Sychev believes that the main goal for every artist is to achieve this ability to create a unique universe. Tatyanin was born 1963 in Lipetsk, Russia where he continues to live and work. As expected, due the lack of financial support for artists during his youth, and despite his passion towards the arts, Tatyanin went on to initially pursue a more economically viable path. Hence, Tatyanin went on enroll and graduate from the Lipetsk Mechanical Engineering Technical School in 1982. Consequently, Tatyanin was also to develop his interest and passion for art whilst in the knowledge that he would be able to physically support himself and his family later on, if need be. So, between 1982-1989 Tatyanin worked at the Lipetsk State Academic Drama Theatre named after Leo Tolstoy. This period say Tatyanin become more comfortable in working with oil and the production of art works in general. Furthermore, this is also when the artist began to sign his canvases, where he shortened his full name to an abbreviation, to which he modestly added, "Genius of the Lipetskian Earth, Artist and Bookseller". As an artist, Tatyanin initially focused upon traditional naïve characters, such as stray animals, whilst also exploring mythological characters such as mermaids. These enticing characters were eventually replaced by well known European artists and today's annoyingly popular anti-heroes, whom the artist calls "vampires". These are such artists as Joseph Beuys, who founded the concept of gesamtjunstwerk or social sculpture. Due to his increased admiration and appreciation of late 20th century artistic movements, Tatyanin went on to found the Lipetsk Centre of Contemporary Art with art collectors Aleksandr Nazarov and Yury Sodorov. This still remains one of the only independent contemporary art centers in Russia. Tatyanin straightforwardly brings artist and citizen together in the heavy black irony of the world around them. It is therefore difficult to evaluate Tatyanin's works through the usual analytic prism of composition and color, in as much as his ideas and unique philosophy are always the dominant elements in them. 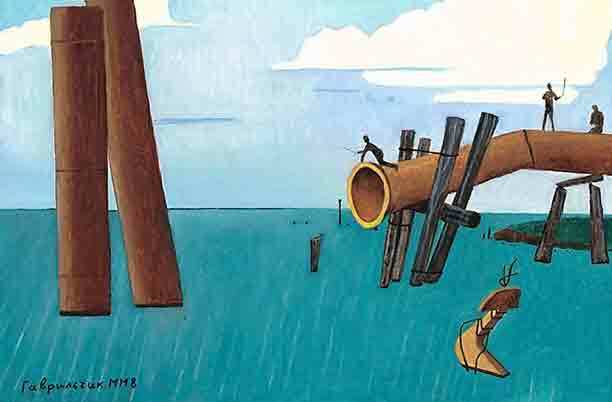 The artist himself recognizes this difficulty, labeling his style "intuitive neo-primitivism", even though it is doubtful whether the mutable prefix can justly be appended to the immutable idea of the naïve. If you wished to cast Tatyanin in a particular mold, then one might quickly call it naïve conceptualism. The artist, unique among all others, is both philosopher and man of words who can describe his finished works telepathically, irrespective of their painterly qualities. Tatyanin should be considered as one of the most relevant artist on the Russian scene today, often appearing on the evening news, while mornings are given over to his canvases. The artist calls the latter "Urgent Painting". Rinat Voligamsi was born in 1968 in Yermolaevo, a small village in the Kuyurgazinskiy District in the southern Urals of Russia. Interested in art and painting from a young age, Voligamsi entered the Ufa State Technological University in the Architecture Department in 1984 after years of self-tutelage. 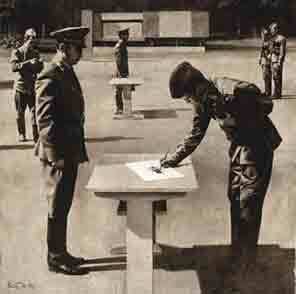 In 1988 due to conscription, he was recruited into the Russian army, interrupting his studies. He graduated the following year, in 1989, and began exhibiting. In 1994 he was awarded the State Prize of Russia, for excellence in the Arts. He began to gain international attention in 2006 with his provocative Unofficial Album, which recounts a parallel and fictitious biography of Vladimir Lenin and his twin brother Sergei. 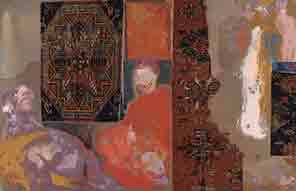 Voligamsi’s work can be found in many important public and private collections including: The Omsk M. A. Vrubel Museum of Fine Arts, Omsk, Russia; The M. B. Nesterov Republican Art Museum, Bashkortostan Republic, Russia; Krasnoyarsk Cultural-Historical Museum Complex, Krasnoyarsk, Russia; Moscow Museum of Modern Art, Moscow; Erarta, Museum and Galleries of Contemporary Art, St. Petersburg. Felix Volosenkov was born in Krasnoarmeisk in the Donetsk Region of Ukraine in 1944. As a boy, he dreamed of becoming a monumentalist. 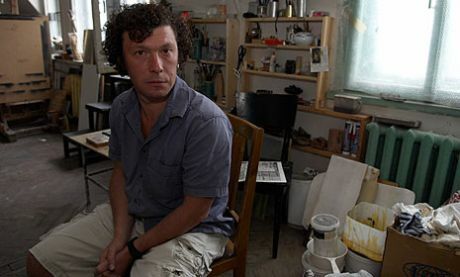 After graduating from the Baku Art School, Volosenkov feared restrictions and decided not to enter the Mukhina Art School or the Academy of Arts. Instead, Volosenkov decided to become a stage artist and went to the Leningrad State Institute of Music, Theatre and Cinematography. Later, this time spent at the Institute would have a great impact on his art: he has arranged his artistic career as a play in the theatre, with its own characters and intrigue. Since 1977 Volosenkov has been working in the theatre where he has designed about 50 projects, while at the same time teaching drawing at the art studio. 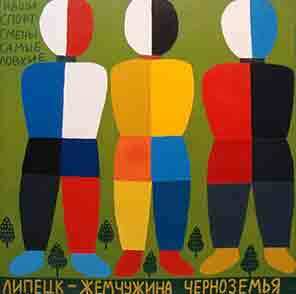 Since 1984 Volosenkov has been exhibiting with Valery Lukka and Vyacheslav Mikhailov. This group of artists has begun to ‘overthrow the canons of painting’. The Petersburg circum-artistic publicity found the artwork of Volosenkov and Lukka to be scandalous and branded their manner as extremely radical. This friendship of Volosenkov, Lukka and Mikhailov anticipated the establishment of the Contemporary Art Academy of the Immortal in Saint-Petersburg by its leader Felix Volosenkov. The group was formed in 1994 with the aim of supporting and developing new styles in contemporary art. Paintings by Volosenkov have complex textures: he uses cloth, foam-rubber, levkas and acrylic. In order to intensify the effect produced by his pictures, the author uses his talent as a stage artist to make the space of canvas into a theatre performance. Irony and the grotesque, unrestrained energy and a touching nature are characteristics of Volosenkov’s artwork that seems to be created in one breath and never leaves you short of thoughts and opinions. Anatoly Zaslavsky was born in 1939 in Kiev (Ukraine). In 1957 he finished Kiev Art School and in 1965 graduated from St. Petersburg State Art and Industry Academy (Department of Monumental Painting). 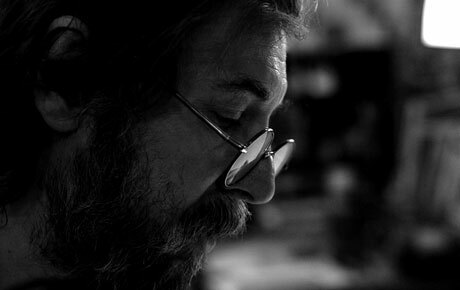 In 1977 he became a member of the Russian Union of Artists. 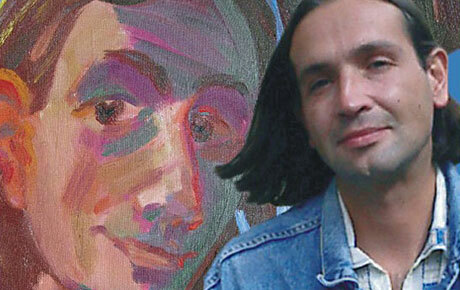 In 1992 Anatoly Zaslavsky became a member of the St. Petersburg Creative. 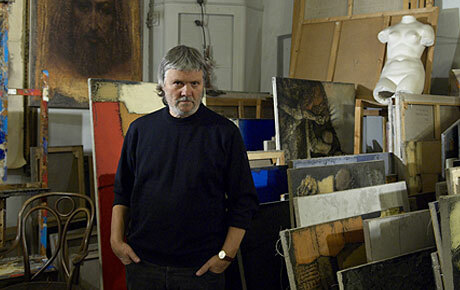 Since 1969 he has participated in numerous group and solo exhibitions in Russia and abroad. At the turn of the seventies and eighties of the twentieth century, when Zaslavsky's creative career was just beginning, his painting was already distinguished from the academic strict manner by its cheerfulness, relaxedness, sincerity and love of color. At the same time, it was far from the so-called "unofficial art". The golden mean, which the artist adhered to, was the most natural way out of the state of ever more heated contradictions between the two poles of art in the Soviet Union. Similar views were shared by such artists as Zaven Arshakuni and Herman Egoshin, who undoubtedly influenced the picturesque manner of Zaslavsky and whom he treated with great respect. 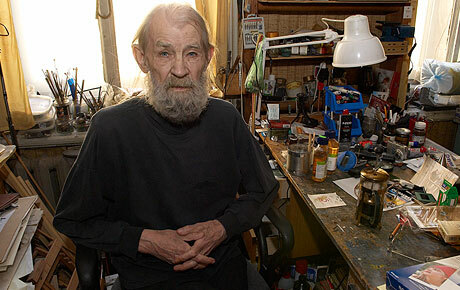 Today Anatoly Zaslavsky is a living classic of St. Petersburg painter, who has influenced a whole generation of artists. Moreover, painting remains for him a purely personal, private matter and problem, a means of self-education and knowledge of the world. "I have developed a habit of realizing the world only when I'm depicting it. It's hard for me to live without this knowledge of the world, I see badly if I do not paint." says the artist.